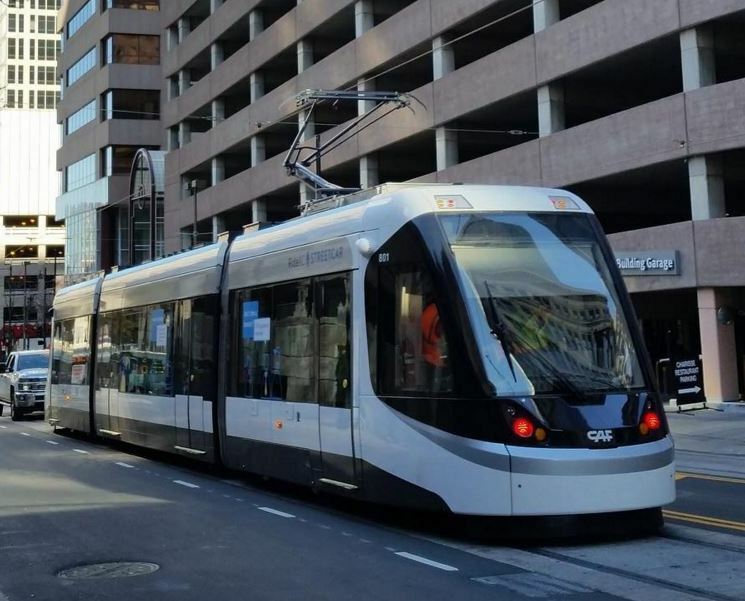 Kansas City, Missouri — At a March 6th public meeting, city planners presented details of their construction schedule for Kansas City’s proposed 2.2-mile, $102 million streetcar project, approved by voters in late December (2012). The details may be instructive for streetcar advocates in other cities, giving them an idea of what’s typically involved in this kind of project. 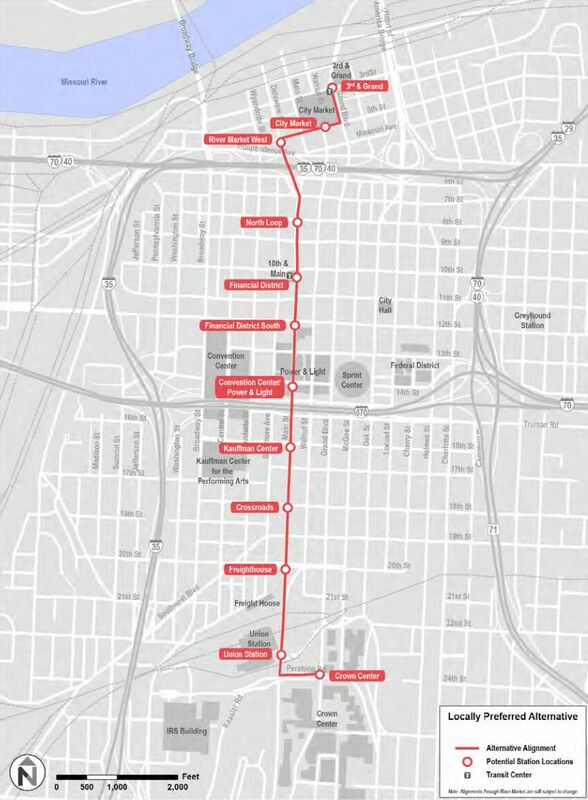 The line is planned to run through the city’s Central Business District from River Market to Union Station, also serving Crossroads and Crown Center. 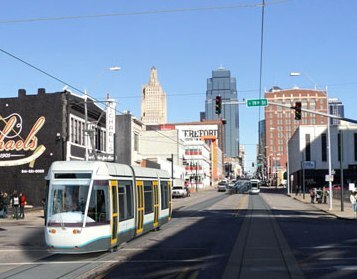 According to a Dec. 28th report in the Kansas City Business Journal, “Proponents of the plan say the line … will spur development along Main Street while helping to attract young, creative residents to the city’s urban core.” The system is currently projected to open for service in 2015. 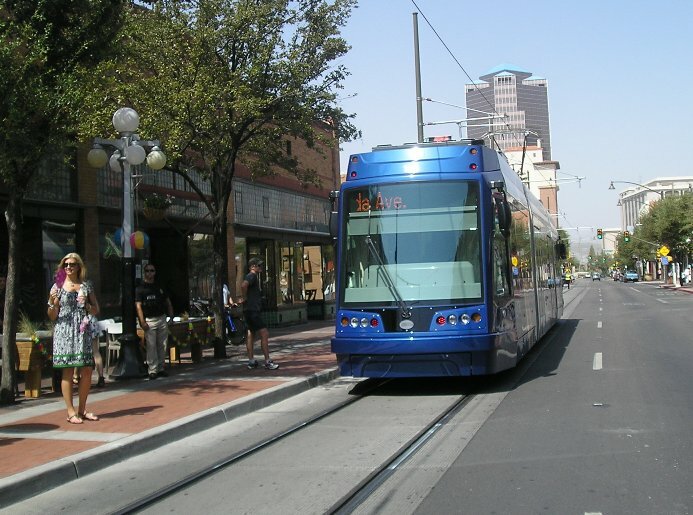 Particularly for transit supporters in other cities considering a streetcar or large light rail transit (LRT) system, it’s instructive to look at the elements of this kind of project. A more recent report (March 7th) in the KC Business Journal provides an opportunity for this kind of examination, laying out the three main phases of the project. • Streetcar rolling stock — to be selected, ordered, delivered. • Tracks installation along Main Street from the River Market to Union Station. • Rolling stock maintenance facility in the River Market to be designed. • Underground utilities to be relocated. That last item — relocating utilities — is not directly part of the rail infrastructure, but it’s a task that usually has to be done (although there are some ways to minimize or avoid it). In many cases, the utilities may have actually needed replacement for years, but the municipality or private utility owner holds off, hoping that the rail project will pick up the tab. 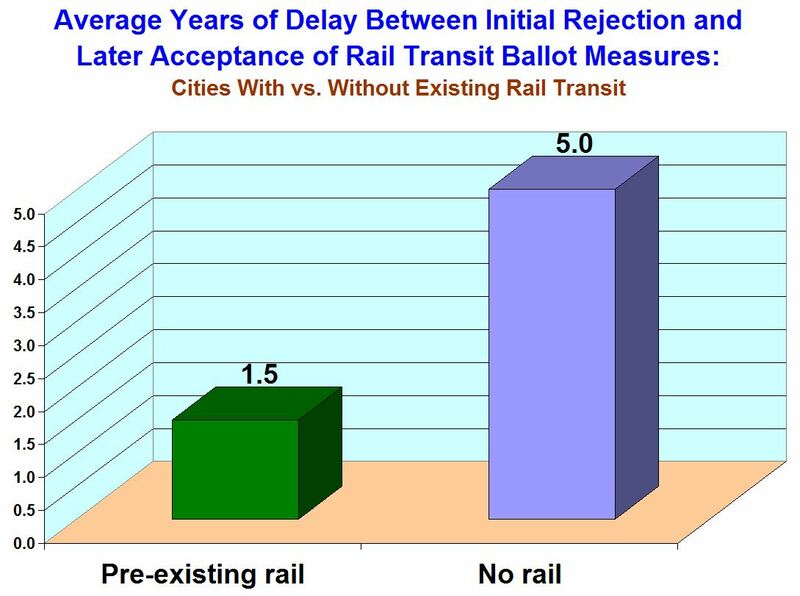 There’s also wide divergence from city to city in terms of who the law specifies should be responsible for paying for such relocation — the agency sponsoring the rail project, or the utility owners. • Opening trenches to remove and relocate utility lines. • Suspending temporary overhead lines for temporary utility relocations. • Clearing the site for the facility and starting construction of the building’s foundation. • Commencing civil engineering work startup of actual shop construction. Phase 2 (from late 2013 to late 2014) includes track installation (in pavement), station construction, and rebullding of streets and sidewalks. 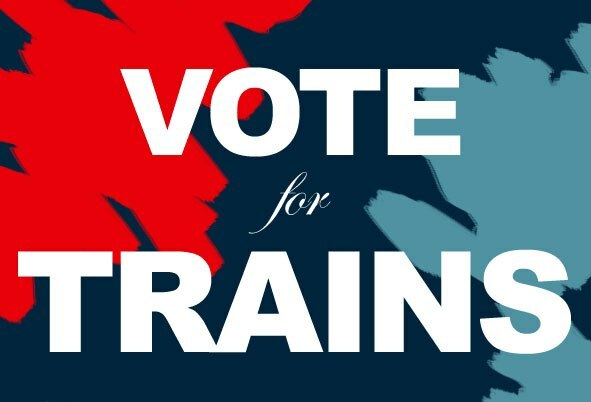 It’s debatable whether this last item, street and sidewalk reconstruction — routine for most urban rail projects — should be considered an indispensable component of the rail transit and assigned as a cost totally to the rail project. To some extent, as with utilities, public works planners often realize that the streets and sidewalks need to be rebuilt anyway, and often wait to let the cost be picked up by the rail project. Also, these kinds of upgrades might be considered as more in the category of “urban amenities”, and some rail advocates argue they should be tallied separately as something like “urban renovation”. On the other hand, it’s arguable that effective access to the new line requires good pedestrian facilities. Furthermore, for federal funding the Federal Transit Administration usually requires it (along with other amenities not directly essential to the transit operation, such as artwork at the stations). • Removing existing pavement and sidewalks. • Reconstructing sidewalks, curbs, and gutters. • Installing railway hardware on track slabs with drainage facilities and special trackwork (switches, crossovers, etc.). • Rebuilding existing curbs, gutters, and sidewalks near stations. Construction of each station is expected to last three to four weeks. Track installation will require a 20- to 25-foot work zone and will close multiple lanes or entire sections of Main Street, depending on the width of the street at the work location. • Installing the overhead contact system (OCS) — i.e., the support poles and wiring for the electric propulsion system (this is often erroneously referred to as “catenary”, which is actually a somewhat heftier type of OCS; however, many streetcar lines and even some larger LRT lines use much simpler single-contact-wire OCS to minimize its visibility). • Installing new traffic signals and street lighting (again, see the discussion above about “urban renovation” and whether the cost of these project elements should be assigned to the urban rail project). • Installing power substations (these are just relatively small power booster units to maintain adequate voltage on the OCS, which tends to drop because of the resistance of the OCS wire). That, then, is what this relatively small KC urban rail project will involve. Hopefully, this information will be helpful to those of you contemplating similar projects for your own cities.